With equities starting the week on a negative note, the VIX managed a third consecutive net daily gain, settling +13.5% @ 15.60. Near term outlook does offer threat of a minor 1-2 day cool down.. but with the Dow headed for 17000, the VIX looks broadly set to battle upward into the low 20s. Suffice to add.. regardless of any near term equity bounce, the market has seen some considerable technical breaks, and it now looks like the VIX will be able to battle upward into the low 20s... along with Dow 17k, and sp'2000. *I exited VIX-long at 16.10 this afternoon. 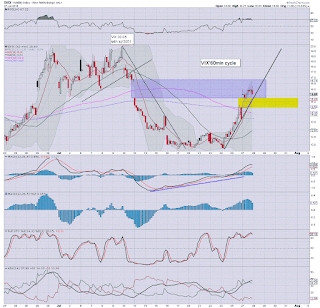 Am seeking a re-entry in the 15.00/14.50 zone... with subsequent upside target of 18/20 by the monthly close. 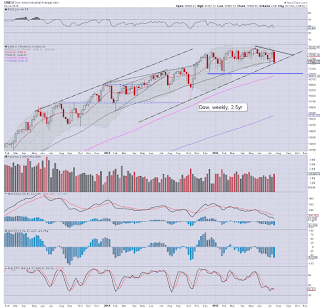 US equity indexes closed broadly weak, sp -12pts @ 2067. The two leaders - Trans/R2K, settled lower by -0.2% and -0.9% respectively. 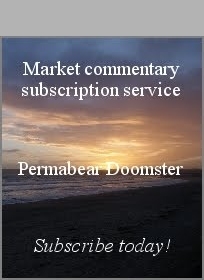 Near term outlook is for further weakness, and regardless of any Wed/Thursday bounce, the market looks set for Dow 17000, sp'2000, along with VIX in the low 20s. For the equity bears... a good start to the week. There is clear VIX resistance around 16.60, and we might well get stuck there tomorrow morning.. before seeing considerable chop into Wed' afternoon, before a moderate 1-2 day bounce. *having exited VIX-long, I am seeking a re-entry in the 15.00/14.50 zone... whether tomorrow, Wed'... or Thursday. US equities look set for renewed weakness into the close, with most indexes closing lower for a fifth consecutive day. 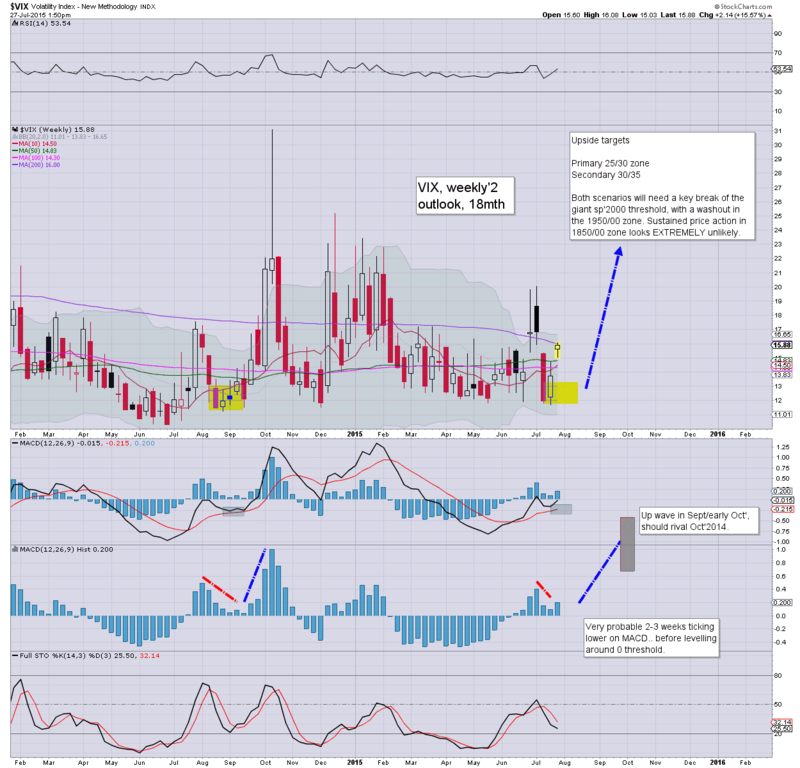 VIX is reflecting some increasing market concern, +15.7% in the 15.90s. Metals remain weak, Gold -$4, and that is keeping downward pressure on the miners, GDX -3.0%. *reading around a bit, somewhat amusing to see some get bullish after the Monday China session. So.. a fair bit of chop today.. and numerous micro up waves.. but still... we're set to close lower once again. Bull maniacs should be seriously concerned at the technical breaks seen on the bigger weekly/monthly charts.. but then... most simply don't care about such matters. *I remain long VIX, but will strongly consider dropping if VIX >16.20 or so before the close. Broadly.. I want to be long VIX all the way into early October. updates into the close... not least if sp' breaks <2060. 3.12pm.. mining stocks starting to collapse again, FCX -6.8%. 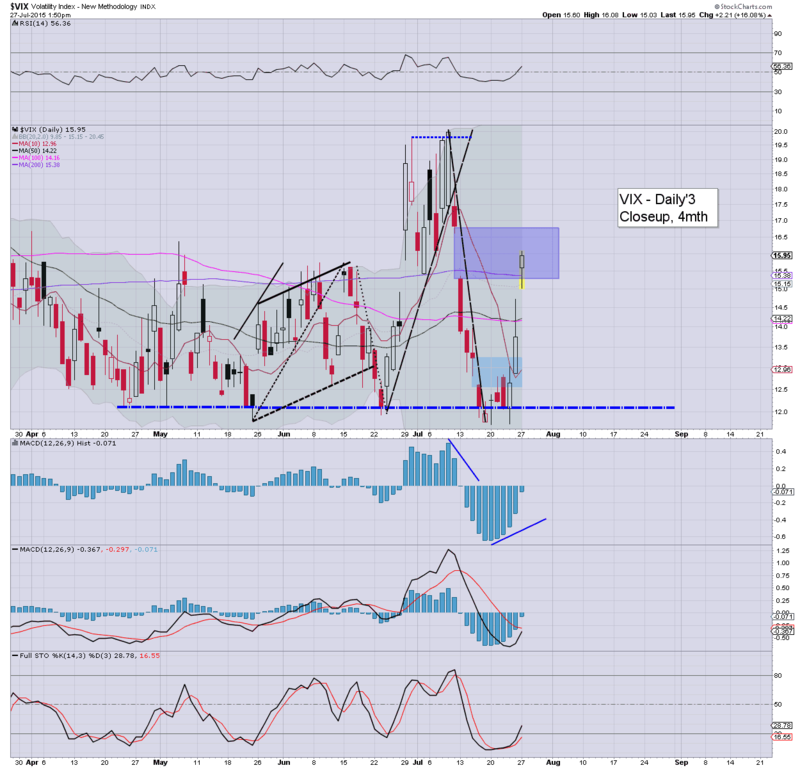 Will re-long VIX... on any sig' drop tomorrow... otherwise.. will sit it out for a day or two. 3.27pm... 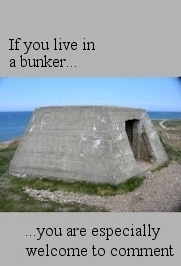 So.. I'm out of VIX... I am a little concerned of cooling back to the 14s tomorrow.. or certainly.. Wednesday. Anyway.. I'm out for a gain... its progress.... but the big money won't likely be made until September. 3.36pm. The rats are getting a little twitchy into the close... not surprisingly. I'm glad to be out.... my VIX trade was getting a little annoying.... despite the trend now looking increasingly strong. 3.45pm... a close under the 200dma looks probable.. but then.. that is the sp'500.. and other indexes (not least the Transports lost the 200dma in May. 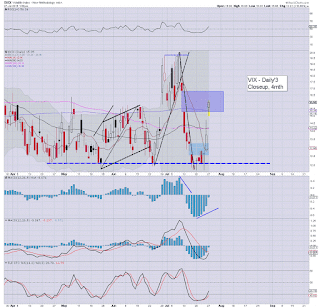 VIX 16.27.... there will be sig' resistance around 16.60.... with threat of cooling to the mid 14s. VIX has broken the morning high, and is back in the 16s. The upper gap zone is around 16.60, with initial weekly resistance also in the 16.60s. Regardless of any Fed/GDP bounce (with VIX 16/17s.. down to 15/14s)... the equity bears look on track for sp'2000.. along with VIX in the low 20s. With two hours to go.... things are getting somewhat interesting. Naturally, many are now wondering how China will manage overnight. 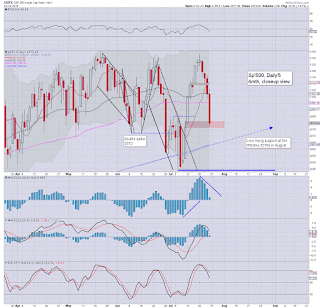 Another major drop would be a critical problem..with the 3373 low within range. Regardless of China though, most world equity markets are rolling over.... lead by the EU. Hell, I'd imagine most do not even reflect upon the issue that the Greek Athex has been shut now for around a month. Whilst equities are holding above the morning low, the VIX remains very close to the early peak of 16.00. 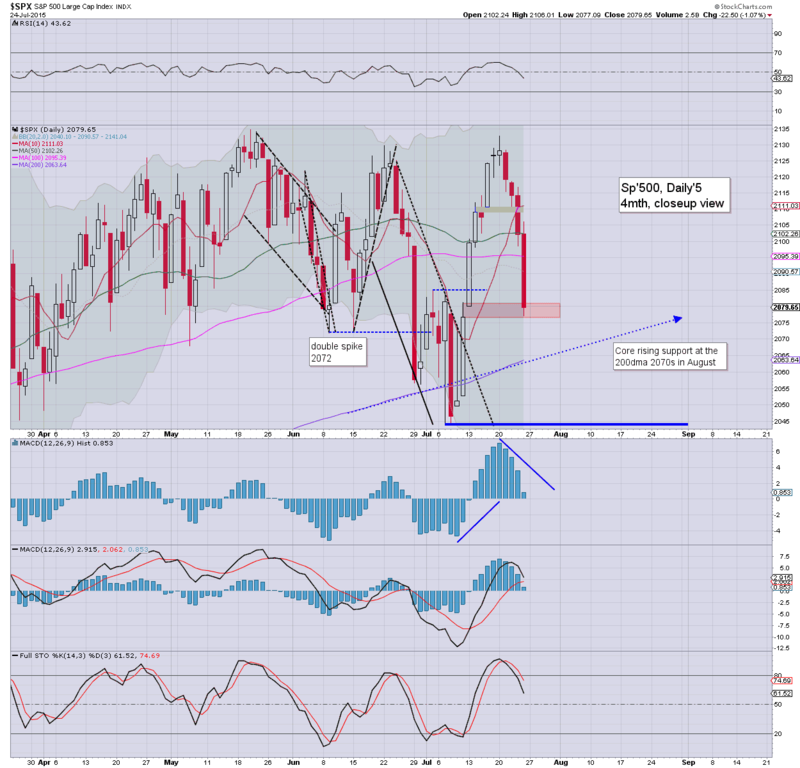 A daily close in the 16s looks probable, which should equate to renewed equity weakness into the sp'2050s. Equity bears look good for Dow 17000, regardless of any 'Fed day' (Wednesday) and/or GDP (Thursday) bounce. 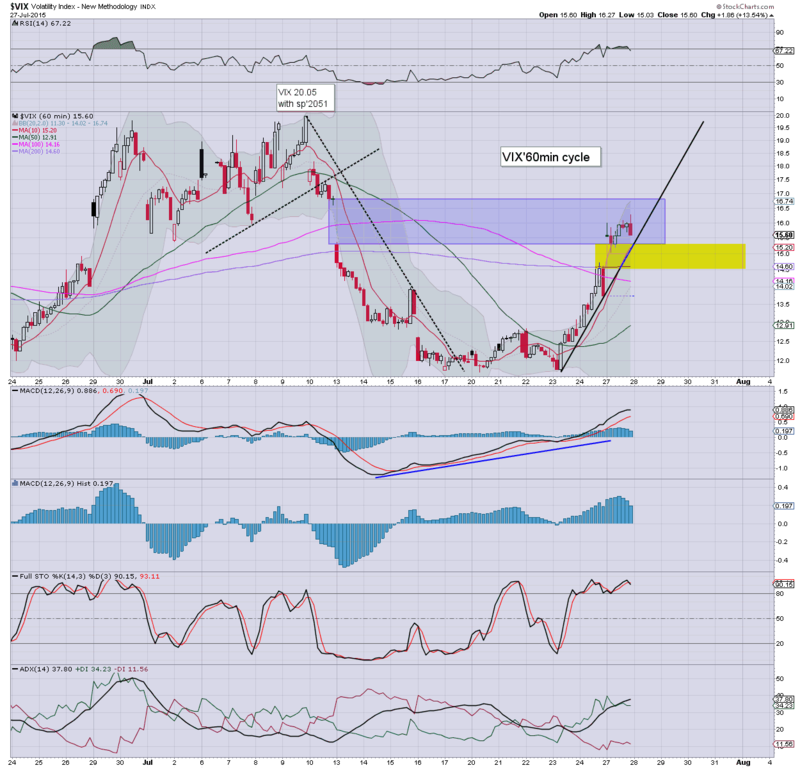 *A second outright bullish candle on the VIX 'rainbow' chart... the 17/18s look due tomorrow. I would only add right now... a bounce.. if brief.. looks due this Wed/Thursday. I will merely look to re-short ANY such bounce.. if there is one. 1.24pm.. New intra high on the VIX.. 16.01.... equities set to break new lows.. <2060 by the close. Despite the usual micro up cycles, it should be clear to most that momentum is increasingly in favour of the equity bears. VIX is reflecting the underlying concern, set for a daily close in the 16s... with the 20s due on any break <sp'2050. *I will likely be frequently referring to chart 1b in the weeks ahead. 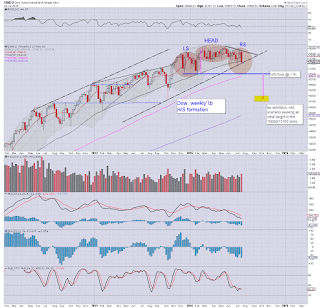 The general H/S bearish price structure applies to the sp'500 too, but it is clearest in the Dow. So... a few little bounces across the morning to washout some of the weaker bears, but broadly... market looks set to fall for the fifth consecutive day. 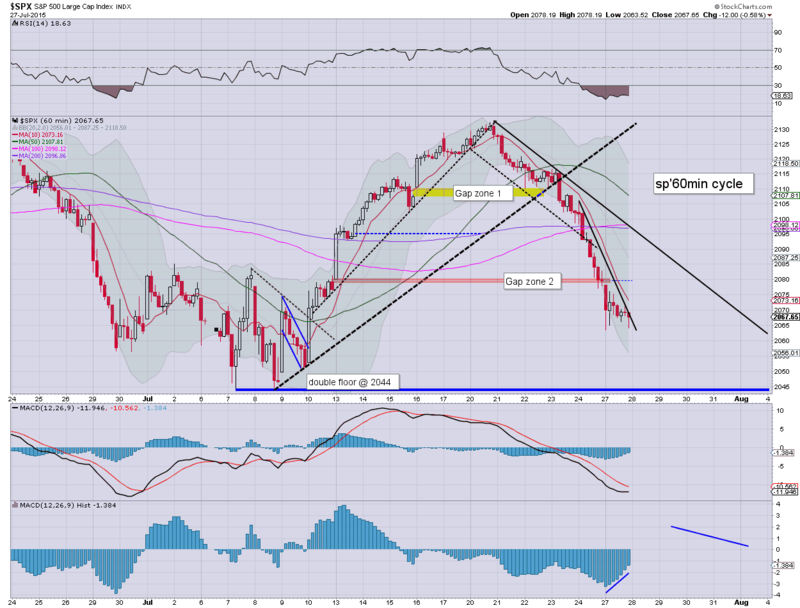 Considering the current swing in momentum, Tuesday looks set for lower levels... at least to the sp'2050 threshold. No doubt some will want to buy the recent floor of 2044, but I can't see that holding now. Regardless of any FOMC bounce, I will be looking to be short the market to sp'2000, and then sidestep an anticipated bounce to the 2050/75 zone. Frankly, things are lining up rather nicely for September. 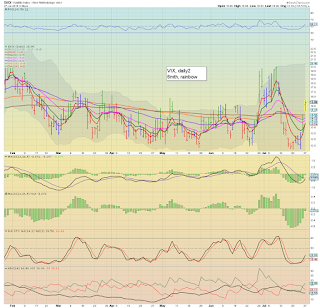 12.21pm.. VIX holding close to the earlier high.. 15.80. A break into the 16s would be significant, and open up a close in the 16.60/17.00s... with sp'2050s. 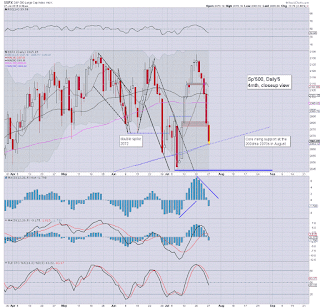 US equities have already seen an early bounce from the opening low of sp'2063. 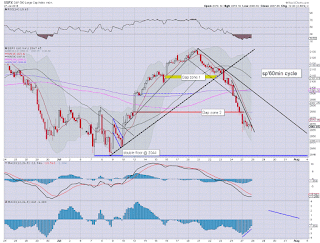 Regardless of any further bounce/chop, there is considerable technical damage seen in the bigger weekly cycles. Despite USD -0.8% in the DXY 96.40s, metals remain weak, Gold -$3, whilst Oil is -1.5% in the $47s. There is a lot to cover... bear with me. 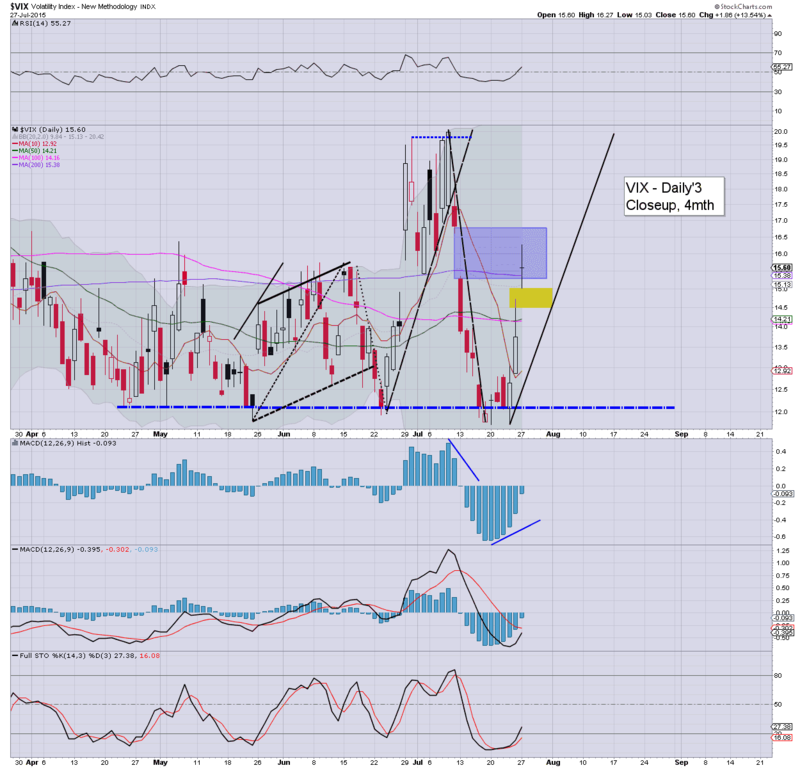 re: VIX... an opening high of 16.00.... upper gap zone is around 16.60. 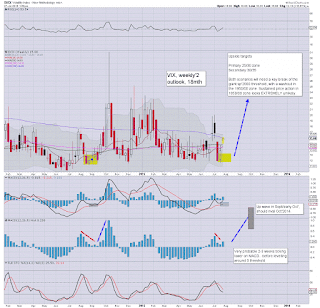 However, if you consider Dow 17k as a valid target in the near term, then VIX is set for the low 20s. A second green candle... and with the MACD (green bar histogram) cycle set to turn positive cycle late today/early tomorrow... equity bears have momentum increasingly swinging their way. TWTR -3.5% in the low $34s.. earnings are tomorrow I believe. 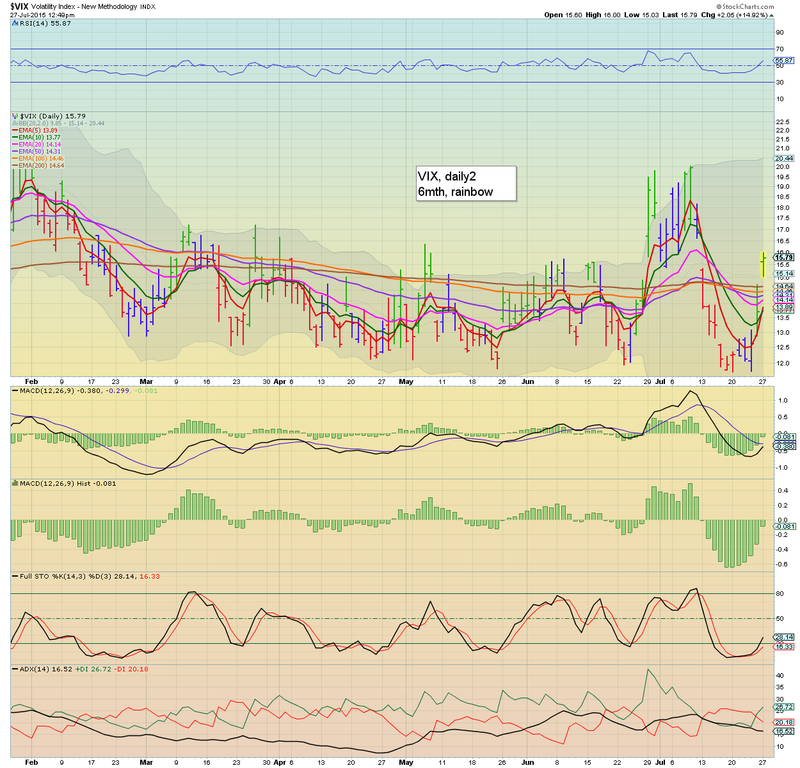 Energy stocks, SDRL -4.2% in the $8.20s... dire... the 6/5s look due. US equities open lower, and are set for the fifth consecutive daily decline. 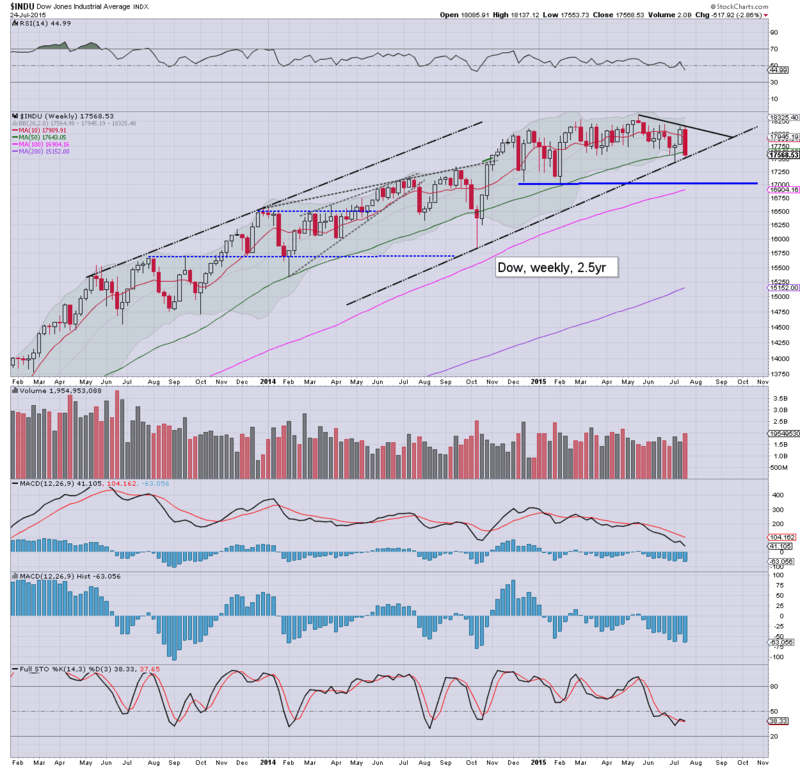 The Dow is leading the way lower, offering a clear break of rising support on the weekly cycle. Next stop is a very probable 17000, which would equate to sp'2000, along with VIX in the low 20s.... this week. With Dow losing 17500, its pretty clear... we're headed for the more rounded 17000 threshold.. which is arguably the floor for a giant H/S formation. I'm aware I'm not the only one who sees it, I first noticed it via INTC. *I remain long VIX... am seeking an exit in the 16/17s.. before the Tuesday close. 10.05am.. a micro bounce, but typically.. we'll get a floor around 11am. Regardless... Dow 17000 looks due.... and that is surely going to kick the VIX into the low 20s. 10.26am.. a little bounce/chop... but the technical damage is done. Dow 17438... so.. 438pts to go. Good morning. Futures are moderately lower, sp -9pts, we're set to open at a new cycle low of 2070. USD is on the slide, -0.6% in the DXY 96.60s. Metals remain weak, Gold -$6, with Silver -0.3%. Oil is weak, -1.4% in the $47s. A fair few had expected an opening bounce to begin the week, but no... we're opening lower... and importantly.. below the Friday low. Market looks set for the 200dma, which will be around 2065 today. It is rather important to recognise the importance of the sustained loss of Dow 17500 today.. it will bode for 17000 this week.. and that in itself would equate to sp'2000.... taking out the double floor of 2044. Strap in everyone.. things could get a little wild this week. Overnight China action: China opened lower and increasingly unravelled into the close, -8.5% @ 3725. The ABC 'bounce' is very likely complete at 4184. First target, the recent low of 3373... then 3200/000. Worse case for the China market by early Oct' is probably around 2500. An interesting aspect is that we have stocks like INTC leading the way lower.. already having broken the key floor (in INTC's case... $29). As noted on the chart... in theory.. price structure is suggestive of 16000/15750 by early October. If correct, market should hold 17000, and then bounce to the 17750/18000 zone.. forming a R/S... before a more severe wave lower in September. 9.26am.. Looks like 200dma will be taken out this morning... and that will be a good bearish start to the week.. regardless of any natural bounce into the afternoon. 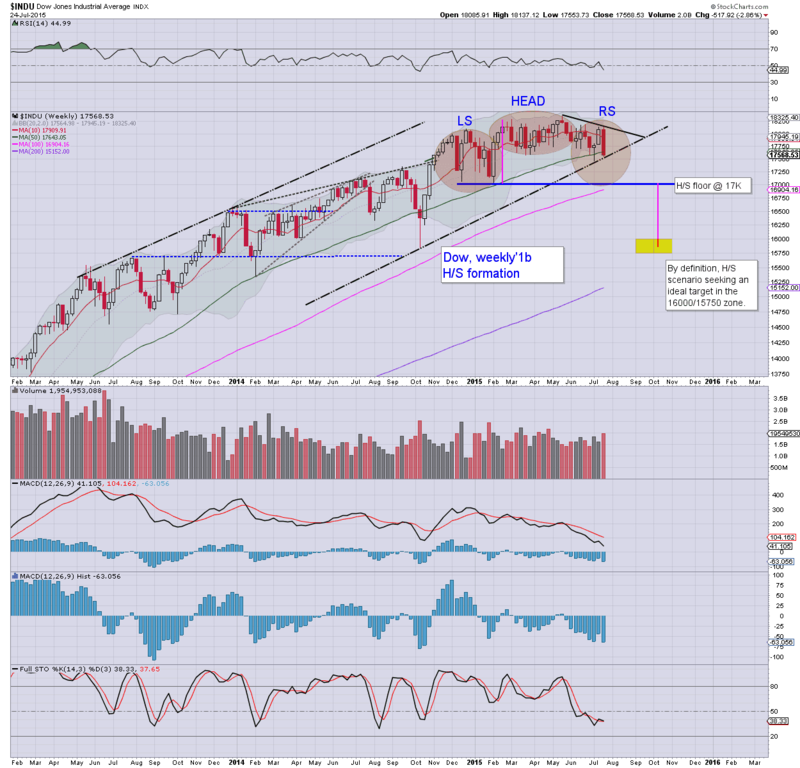 9.31am.. Clear break of Dow 17500... busted trend on the weekly.... next stop.. (in theory).. 17K.